Beginning in kindergarten, students learn reading, mathematical memory and executive order strategies in order to determine how to break down complicated tasks. These strategies empower our students to engage in thinking and problem-solving skills beyond the classroom setting. Students who may have struggled in a public school environment flourish in our intentionally small classrooms. With a student to teacher ratio of 8:1, our highly trained teachers have the ability to truly get to know each student. This allows them to better understand each students’ strengths and challenges in order to personalize their approach. Curriculum at NewBridge is rooted in the principles of the educational approach known as Orton-Gillingham. Known as the “Gold Standard” for teaching children with dyslexia, the Orton-Gillingham approach is an instructional technique that has been particularly effective for students affected by language learning differences for over 70 years. The OG approach helps the teacher target the specific learning challenges of each individual student through diagnostic assessments and prescriptive teaching. We teach our students to determine the size of the problem, self-advocacy, modulation, perspective taking, etc. Using a “common language” allows for deeper understanding and usage in order to develop dynamic problem solving to navigate and succeed beyond their time at NewBridge. **Some of the programs used in every NewBridge classroom include: Social Thinking, Zones of Regulation, Handwriting Without Tears and Brain Gym, Size of the Problem, (Ball-vis-x, is an OT only program). The most important principle of our school is to provide a nurturing learning environment, thus enabling students to increase their self-esteem through academic and social success. Students learn self-advocacy skills, coping strategies, and goal-setting skills that help bolster their confidence and take ownership of their education. We feel it is our duty to provide our students an effective support system, which allows them to open up their minds to learning. At NewBridge, we believe that technology does not replace effective teaching, but it does have the ability to enhance learning, aid students with their differences, and bring content to life in a way that is more engaging. Using both iPads and computers, students who struggle with reading, writing and spelling can access and demonstrate higher-level thinking skills more independently. 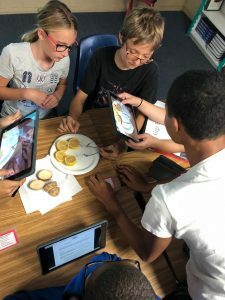 The use of iPads also assists students who have executive functioning difficulties with staying organized, returning homework and using learning strategies. Apple products give our students the ability to maneuver between devices seamlessly when completing academic tasks.Each student is issued an iPad on the first day of school and must first pass a module on the importance of being responsible digital citizens before they are given complete access to the device. iPads are used for learning in all subjects, in addition to homework and study apps for test prep. NewBridge also recognizes the importance of incorporating STEM concepts and coding in today’s classroom by teaching students to use iPad add-on systems such as Osmo, Edison, and robot kits. 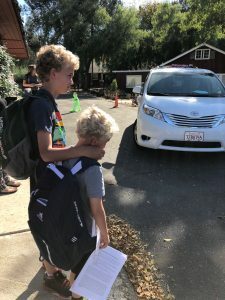 **Proud Note – Our Team Leaders have attended and presented at iPad conferences throughout California and for the San Diego branch of the International Dyslexia Association. Plentiful research exists that indicates physical exercise assists with the learning process, improves problem-solving skills and boosts self-esteem. Students who exercise on a daily basis often experience reduced stress/anxiety and increases in attention span, in addition to better balance, motor skills, and body awareness. Therefore, we believe daily structured PE and recess is vital to our students’ physical and mental wellbeing. Homework is often an area of difficulty between students with learning differences and their parents. Homework Club was created to eliminate stress and encourage independence. It is an hour of afterschool, structured time when students can complete their assigned homework. We have an integrated art program to foster creativity and carry academic themes into art instruction. Annual camping trip to Anza Borrego Desert State Park to enjoy hiking, campfires, splashing in water falls and so much more. School Science Night when we showcase our critical thinking skills. Language Arts Night when our art and words come together. Annual School Plays where our students get to “act up” with pride. Some of our field trips include: Legoland, San Diego Safari Park, bowling, ice skating, Movie Theater, Civil War re-enactment, Museums, and theater productions. On campus activities including: Dr. Bronner’s Snow Day, Mad Science and Animal Encounters. Graduation Ceremony and Promotion when we get the opportunity to tell parents about their wonderful kids.